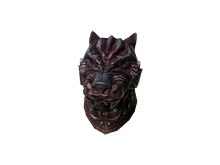 Helmet worn by the ferocious Vengarl of Forossa. unlike a mad beast on the battlefield. Exhaust Head of Vengarl's dialogue. Raises Vitality by two points.